Maybe it’s the Joni Pitkanen Effect. The NHLPA approved hybrid icing on Monday, and it’s a bit of a stunner given what was expected from the union. Insiders like Darren Dreger were predicting the players would opt for the status quo and reject hybrid icing during their formal vote before the season. And yet NHL deputy commissioner Bill Daly revealed that the players had approved the new measure for the 2013-14 season. “For the purpose of this rule, the center red line will divide the ice into halves. Should any player of a team, equal or superior in numerical strength (power-play) to the opposing team, shoot, bat or deflect the puck from his own half of the ice beyond the goal line of the opposing team, play shall be stopped. For the purpose of deflected pucks, this only applies when the puck was originally propelled down the ice by the offending team. “For the purpose of this rule, the point of last contact with the puck by the team in possession shall be used to determine whether icing has occurred or not. As such, the team in possession must “gain the line” in order for the icing to be nullified. “Gaining the line” shall mean that the puck, while on the player’s stick (not the player’s skate) must make contact with the center red line in order to nullify a potential icing. “For the purpose of interpretation of the rule, there are two judgments required for "icing the puck". The Linesman must first determine that the puck will cross the goal line. Once the Linesman determines that the puck will cross the goal line, icing is completed upon the determination as to which player (attacking or defending) would first touch the puck. This decision by the Linesman will be made the instant the first player reaches the end zone face-off dots with the player's skate being the determining factor. Should the puck be shot down the ice in such a manner that it travels around the boards and/or back towards the end zone face-off dots, the same procedure shall be in effect in that the Linesman shall determine within a similar distance as to who will have touched the puck first. “For clarification, the determining factor is which player would first touch the puck, not which player would first reach the end zone face-off dots. This decision was one of subjectivity vs. safety. Watching hybrid icing in the preseason and tested in the minor leagues, there are basic problems with giving linesmen a judgment call on icing, rather than having a player touch the puck. The rule essentially uses the faceoff dot in the defensive zone as the landmark; if a defending player reaches the dot first, it’s icing. One of the central problems I have with the rule, besides having an on-ice official project what could might potentially happen on a play, is that the rule seems geared toward a race for the puck on the same side of the ice. What happens when you have two players on opposite sides of the ice chasing a puck behind the net? Do we need a laser shooting across the faceoff dots like the finish line of track and field race? Watch the games with hybrid icing. Imagine you’re a noob in the cheap seats. All of a sudden play stops without a player having possession of the puck, on a subjective call from the linesman. The chase for the puck still exists, which was always the desire from NHL critics of no-touch icing; but it just looks strange to see the chase end prematurely. This injury to Carolina Hurricanes defenseman Joni Pitkanen may have ended his career. It’s an injury that hybrid icing would have likely prevented. It’s an injury, we imagine, resonated with the players voting. The fact is that suicide runs to the end boards can not just lead to injury, but catastrophic injury. There’s every reason for the NHL and its players to see if they can be prevented with a rule that retains the chase of the puck and the chance to make a play, but without that level of risk. Of course, that’s in theory. Doug Weight, Islanders assistant, told NHL.com that hybrid icing might still lead to injury. "If our forward beats the D-man to the dot it still becomes a full speed sprint to the boards with the D-man able to line up the forward." 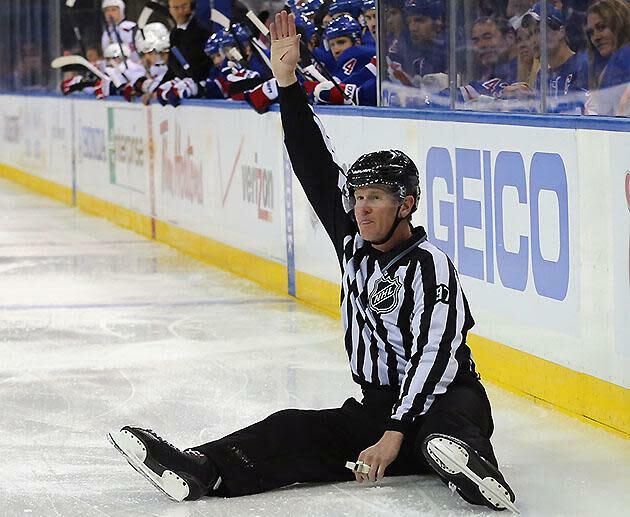 In reality, the NHL and the NHLPA have approved a new rule that adds a subjective call to the officials’ responsibilities that will undoubtedly lead to blown calls that otherwise would have been obvious, black-or-white decisions under the current rules. Don't worry, at least there's video review of these subjective calls ... oh right, we're not there yet, are we NHL?